Precision hand tachometer in sturdy die-cast aluminium casing. Large digital display, easy to use. Lengths and speeds in selectable international units. 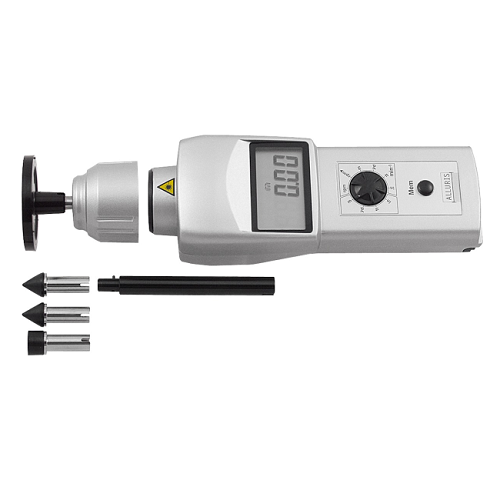 Laser hand tachometer for non-contact measurements at distances up to 4 m. Also for contact measurements using multi-impulse adapter (included). 2 measuring tips, surface disc 6″″ No. 471311, female centre, extension shaft, operating manual, protective case, 2 batteries No. 081556 size LR6. Additionally with screw-in adapter and reflector strips.